Peel and finely dice the onion. Pick and finely chop the herbs. Heat a heavy bottomed pan and sweat the onions with a drizzle of olive oil. Add the rice and stir to coat in oil. Deglaze with the white wine and keep stirring until all of the liquid has been absorbed. Bring twice the volume of rice in water to a simmer and add this a ladleful at a time, allowing each one to be absorbed before adding more. It should take 15 to 18 minutes for the rice to cook. Zest the lemons and limes. Juice half of each fruit, keeping the juice separate from the zest. Trim the belly from each sea bass fillet and remove the pin bones. Carefully remove the skin and then cut each fillet into 3 slices. Season with salt and then sprinkle with citrus zest. Roll each slice of sea bass up and secure with a cocktail stick. 5 minutes before the risotto is cooked, heat the oil in a frying pan. Add the fish to the pan and cook over a medium heat for 1 minute and then wipe the grease from the pan. Deglaze the picatta with the white wine and the citrus juice and allow to reduce by a quarter. Add the butter, remove from the heat and allow to melt, stirring often. When the rice is cooked, stir in the butter, parmesan, pepper and the herbs, reserving a small amount of the latter to use as a garnish. 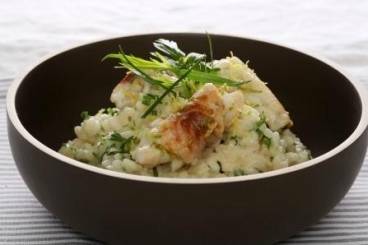 Serve the risotto in deep plates or bowls. Carefully remove the cocktail sticks from the picatta and place them on top of the risotto. Finish with a sprinkling of fresh herbs and serve immediately.